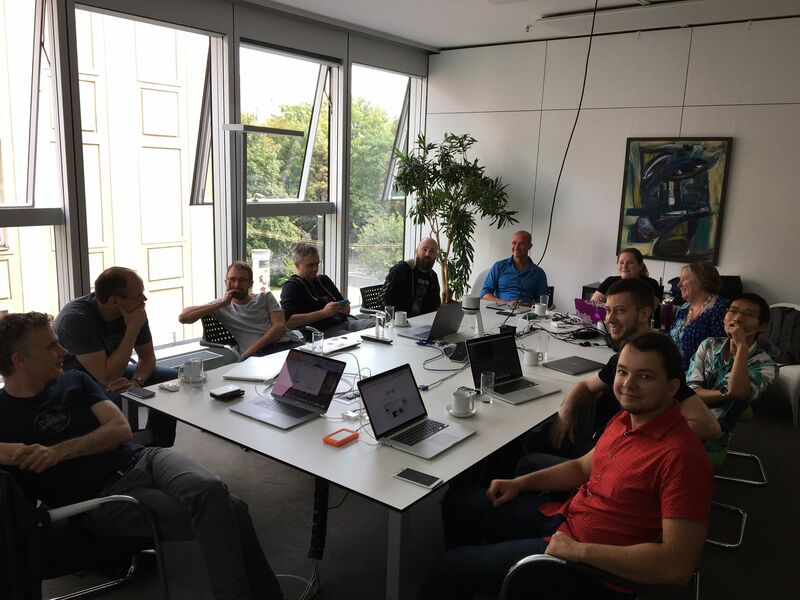 It’s summer (at least, in the northern hemisphere), and while many folks are out on vacation/holiday, we here at Community Central are still busy working to improve your SAP Community experience. We are in the process of rolling out some more improvements to the profile, and I wanted to share with you what you can expect to see today and in the weeks to come. 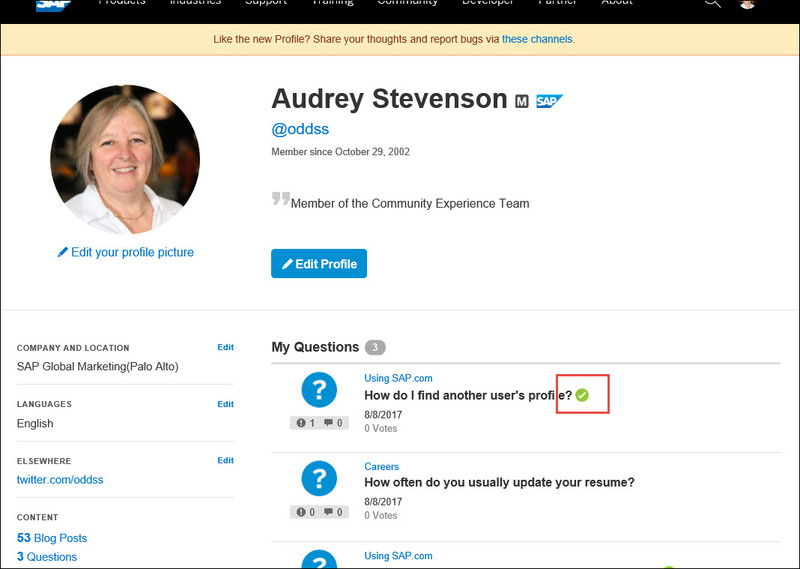 You should also notice that content appears in the profile much more quickly than before, close to realtime. This includes new content as well as updates to content. 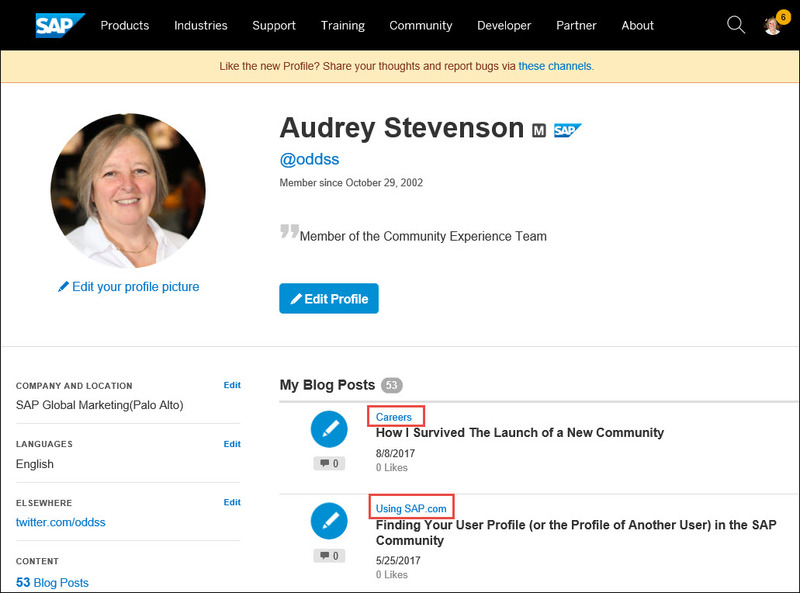 And if you’re one of those who uses SAP Community on a mobile device, you’ll see that the mobile interface for the content overview and content lists in the profile has received an overhaul too, making it more user-friendly. Unfortunately, after we rolled these items out yesterday, we became aware of an unpredictable (and infrequent) bug in the list of answers in profiles. The bug, which we did not encounter in our QA system, displays HTML code and answer text for some answers listed in some profiles, instead of the question title. The team investigated the issue and identified a fix and is in the process of rolling it out. So if it isn’t already gone now, the bug should disappear from the content lists in the profile shortly. And while the profile team is busy rolling out these features, they will also be working on a way to add the content type “comments” (on blogs, questions, and answers) to the profile. We’re trying to identify a good way to present those in the user interface, and the UX folks are working through that, so that might take a while longer to roll out. Text search within the lists, which will search for text not only in the titles but also in the content behind the titles, is also on the roadmap. https://ideas.sap.com/D41804 Show me ALL my content! So, as you can see, the team has been busy and will continue to stay busy, whether it’s vacation season or not! I will update this post when the items actually roll out. And there it is! Excited to announce that Coffee Corner discussions are now also listed in your profile! And now archived documents are listed in the profile as well. And now archived discussions are listed in the profile as well. 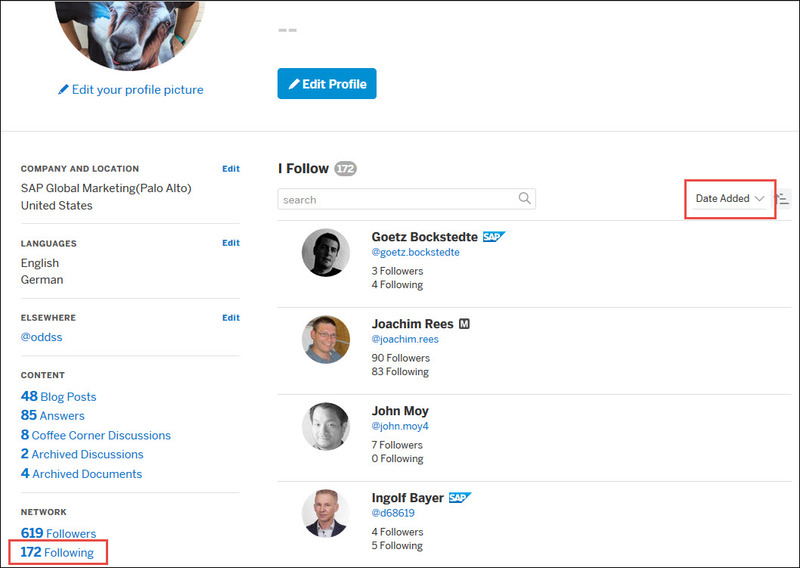 In the Following and Followers sections of the profile, we’ve rolled out an additional sort order: by date added. Finally an update where, when I go through the list, I think for every item “Nice! Yeah, I like that!”. Looking forward to “coming next” stuff, too. BTW: I have that bug, too (HTML code instead of link to the answer). Wondered what was going on, when you wrote about it. I’ll keep an eye on it to see, when it’s fixed. Thanks for the update Audrey! Fix is already on SAP Answers, so we are now running a new import and then all incorrect answers should appear fine in a few hours. Update: Still not perfect, continuing working on it. 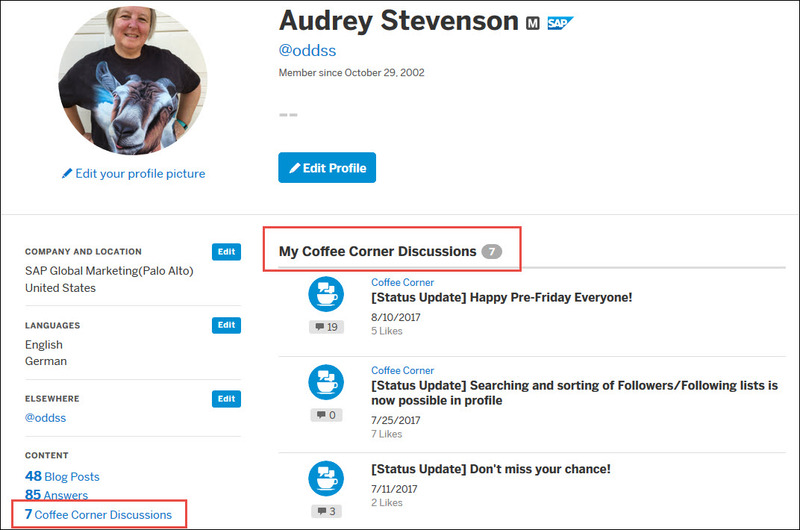 Just updated the blog with latest item that rolled out today: Coffee Corner discussions listed in the profile now! Why do some CC discussions show the tag “Coffee Corner” and some not (you can even see it in your screenshot here in the blog)? I’d guessed all of them should have that tag and since it’s all the same, there would be no need to show it for any of those discussions? Started investigating it, the root cause does not seem to related to the new features of the profile. We’ll notify the respective team and investigate further. Since it seemed redundant to show the Coffee Corner tag for all the Coffee Corner discussions in the profile, we have now removed it entirely from that list in the profile. Yeah, just noticed it, nice! 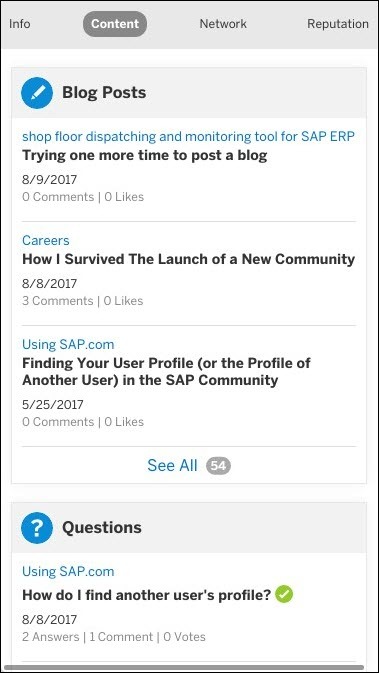 Now the only Content missing is Comments (on Blogs, Questions, Answers, Discussions etc. ) and <strikeout>Ideas</strikeout> “Improvement Request“. 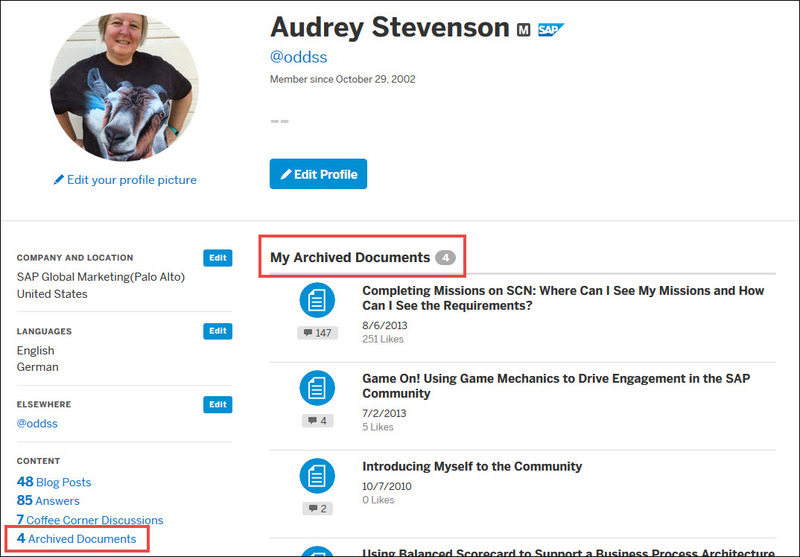 Just updated the blog with latest item that rolled out today: now archived documents are shown in the profile as well. I’m feeling a little dizzy with this fast delivering. Maybe share it in the Coffee Corner to reach more people with these news? This only effects SAP employees, correct? There are some older documents that were created by non-employees as well. if you check the archived documents for ABAP Development, for example, you’ll see some of these in the list. To my knowledge, multiple photos in the profile was not a highly requested feature and is not currently planned to be implemented. Additional content types,of which CC discussions and archived content are some examples, were highly requested, so that is where the active profile development is currently concentrated. The profile team is also actively working on a profile interface redesign, which is needed to accommodate many of the other highly requested features, including showing (and managing) your followed tags in your profile. You are right that it isn’t a high priority. I was commenting on my view of thr “perfect profile” for what else it could have. 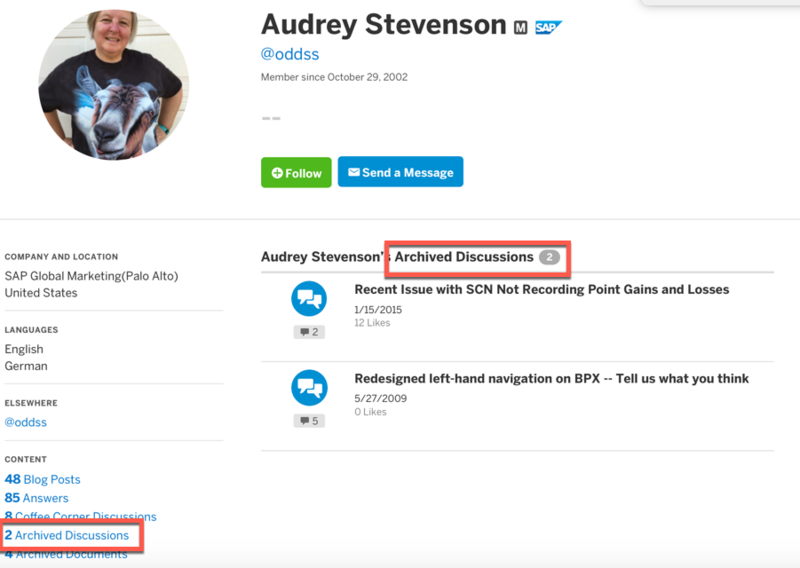 I think back to old platform and those two items and bookmarking were the gaps/differences functionality wise missing in people profile. Some of these are nice to have, for others – I would say ‘essential’. agree with most of your points but some might be minor tweaks to existing functions. The statistics for users – I had thought of similiar when the 1DX first kicked off. But I wondered if such information might be restricted to moderators initially. However, it would be nice to know how active some members are and how they contribute to community quality by closing out their questions, etc. is there any information if content in draft status and under moderation will also show up in the profile some time in the future (for the account owner, not visible to all visitors)? Maybe it would be enough to put them in the same categories, but with another icon so they stand out. Yes! Draft blogs and items in moderation are also in the list of content types to be added. Those require the redesigned profile, so will roll out sometime after that redesign is implemented. You should make more wind about the good news. I think the access to the archived SCN questions went a bit under its value. But yes, we’ll try to make the changes more widely known.